A Russian photographer from the TASS news agency, who was the official photographer for Russia's Foreign Minister Lavrov during his US trip, has spoken out about the hype surrounding his recent work assignment, describing the criticism as "absurd and ludicrous." On Wednesday, photographer Aleksandr Shcherbak, together with an American photojournalist, were in the Oval Office ahead of the closed-door meeting between Lavrov and US President Donald Trump and tasked with taking official pictures to be distributed to international media. "Proper protocol was followed in this procedure," the White House Deputy Press Secretary Sarah Sanders said at a Thursday press briefing, adding that the White House also "had an official photographer in the room." However, the routine assignment triggered hysteria in the US media and spurred a range of conspiracy theories. There was even a suggestion that Shcherbak could have planted a spying device in the Oval Office. “I think this media outcry is due to their anger of not being allowed in for such an important meeting. But I’m not surprised anymore by what Western media outlets say. As we have seen they do not hold themselves to any ethical standard,” the photographer added. Describing the whole situation as "nonsense," the Russian photographer posted an "address to the US media" on his Facebook page. "I am an individual who is not in the public eye and I've never commented on my work before, but this hysteria around my photoshoot at the White House has forced me to write this post," Shcherbak wrote on Thursday. As part of the Russian press pool, he has covered many of Lavrov's official trips around the globe, including in the US, the photographer said, explaining that a procedure for such events is routine: "The lists of journalists who cover trips are always submitted beforehand. And everyone knows who works where, who represents whom. There was nothing unusual about the photoshoot with Trump and Lavrov. Everything was typical. After the meeting with Tillerson I was taken by a US representative to the White House. I was scanned, patted down, and then sniffed by canines," the photographer said, adding that he was also "introduced to a female photographer who works there and was told to stay by her side as she knows all the protocol details." 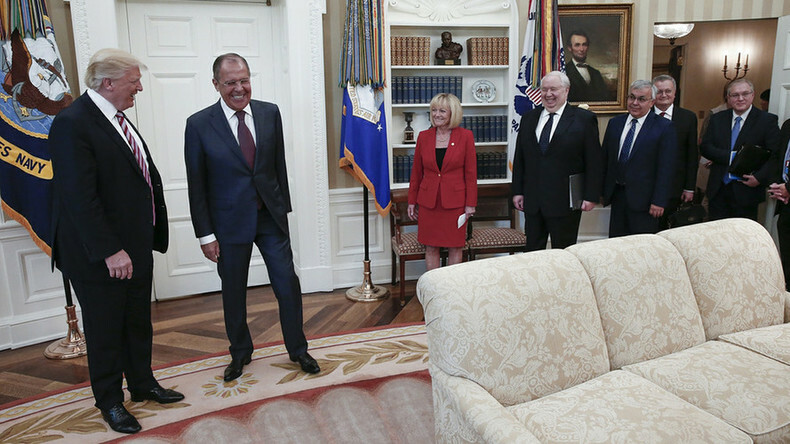 Saying that his work in the Oval Office lasted "for just a minute," the photojournalist said he immediately left the office and then left the White House for the Russian embassy, where Lavrov's news conference was held. "I am urging US journalists not to lose their professional dignity and not to pin the blame on other people for their failure in organizing the photoshoot and the failure to provide access to their media. I have worked as a professional photo correspondent for many years and I am facing such absurd and ludicrous charges for the first time," Shcherbak concluded. Having shared his post, Russia's Foreign Ministry spokeswoman, Maria Zakharova said the American media had "touched the bottom" by "bullying" their colleagues. In a separate post on the same issue, Zakharova asked why the Russian photographer had been singled out and why his assignment has attracted such negative attention. Zakharova referenced another recent photo-op at the White House which has not raised questions from the US media. Referring to the photograph of Trump with the Ukrainian Minister of Foreign Affairs, Pavlo Klimkin "in the very same Oval Office," in which Klimkin is seen with his hands on Trump's table, with the president seated beside him, the Russian official pointed out that the Ukrainian minister might had left his fingerprints on the US president's desk.